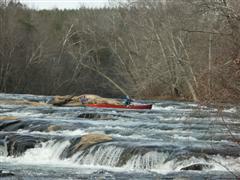 We put in at Moores Mill and take out at the Anglin Mill access which is under the Anglin Mill bridge on river left. This section has three places with Class II rapids. One is "Byrd's Ledge" which is on the state line. It is where the survey party that marked the border between NC and Va crossed the Mayo. The most challenging is "The Stair Steps" which is a series of ledges across the river.